Fiji’s Moala coral gardens, June 2013. Image by Dr. Andy Bruckner, Global Reef Expedition. Fiji’s reefs house some 333 species of corals of all shapes, sizes and colors, many of which we’ve seen in Lau Province. We’ve examined many reef types, some which fringe the shore (fringing reefs), some in the center of a lagoon (lagoonal patch reefs), and some that form a barrier between the open ocean and the lagoon (barrier reefs). We’ve also surveyed different habitats within these reefs – the reef flat, reef crest, pinnacles and coral bommies, fore reef slope and lagoonal floor, from about 30 meters (m) depth to just below the water’s surface. Unusual pigmentation in a Leptoseris sp. colony in Fiji. Image by Dr. Andy Bruckner. For each survey, we record the type of coral, how much of the bottom is covered by each coral, the sizes of the corals, and their health, within a defined area (10 m belt transect). What’s remarkable is how vastly different the reefs are on each island and sometimes between reefs within an island. After nine islands, we continue to add new corals to our species list and often come up from a dive in awe of what we’ve witnessed. Some species, such as the magnificent bubble coral (Plerogyra sinuosa), whose surface covered in translucent grape-like bubbles by day and elongate, deadly tentacles by night (well, not to a human, but extremely painful if you accidentally run into them), we’ve seen just once. 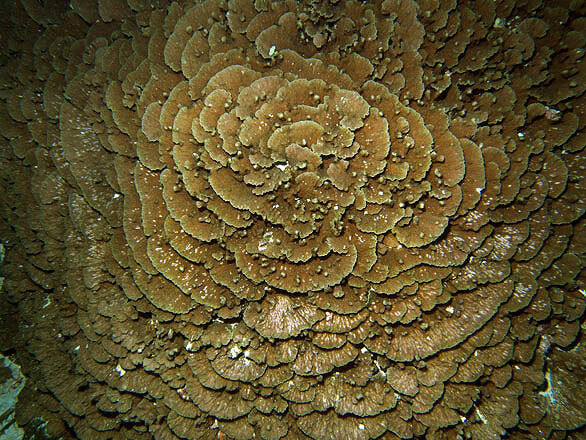 Other corals, such as the large table-forming corals in the genus Acropora (acroporids) are found everywhere. 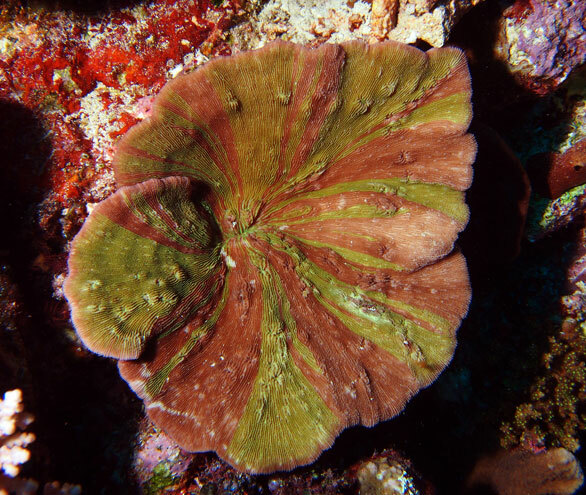 They often form multiple canopy layers, towering above other corals and covering much of the bottom. Nevertheless, these tables (and other acroporids such as the staghorn corals) consist of more than 150 different species, each with different patterns of branching, different skeletal structures, and highly variable coloration. Huge Merulina sp. colony in Fiji. Image by Dr. Andy Bruckner. 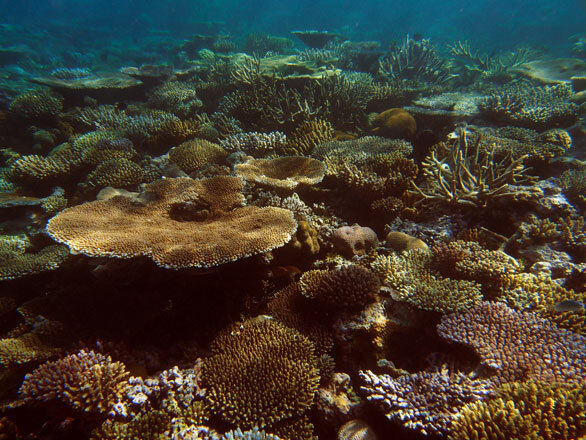 The state of the corals also varies from one reef to the next. We’ve seen reefs with nearly 100% of the bottom covered by coral and others with few corals. Also, the size of individual colonies can vary from just a few centimeters to over 5 m (e.g. Diploastrea). Because we have no way of knowing the exact age of a coral, we measure their sizes – this is a proxy for age which provides useful information on the past history and possibly future trajectories of a coral reef. For instance a reef with only small corals is likely to have been severely damaged but is recovering, whereas a reef with only large corals may have had a long history without disturbance. An assessment of coral condition (e.g. health) provides further information necessary to understand possible causes of damage or threats, and can help predict the future fate of that reef. So how healthy are the corals of Lau Province? Check back tomorrow to find out. Visit the Global Reef Expedition Site to sign up for frequent updates directly from the science team. Science Without Borders® is the overarching theme of the Khaled bin Sultan Living Oceans Foundation. Its purposes are to provide financial sponsorship of marine conservation programs and scientific research, and to promote public awareness of the need to preserve, protect and restore the world’s oceans and aquatic resources.